Pics and Kicks: Guess Who? Guess who I ran into last week. Good thing I recently started riding the "Lost wave," otherwise he would have just been the big guy standing next to me at the book store. . . . I'd never have known. We chatted it up for a few minutes. He was very gracious and kind. His girlfriend was ESPECIALLY darling and sweet. And well, there you have it. I heart Hurley too. Saweet. you have fulfilled my life's dream. truly you have. i would have hugged him like no other. i love me some jorge garcia! Dude thats awesome. The BYUH bookstore? Anyways, that guy is classic. bet he was real nice. Seen him on late night shows and he seems real funny. I've never met anyone famous. I seen jack johnson on the beach once LOL. Yes, I've met Jack as well. Nice man, cute kids. I met the guy who plays Locke at the Fast Lube Oil Change next to Costco on H2. He drives a blue Prius! My husband will totally be skulking around Kaneohe now for a glimpse of your guy! how fun! i totally saw him too one day at longs drugs..he must frequent k-town. how brave of you to talk to him! i just screamed (we were in the car) THERE"S HURLEY. and he totally heard me! i was red faced to say the least.. I ran into him in Lanikai a few weeks ago! Made my day!!! Jac goes to school with Desmond's son - I told her I need an intro with his pops - just for kicks! 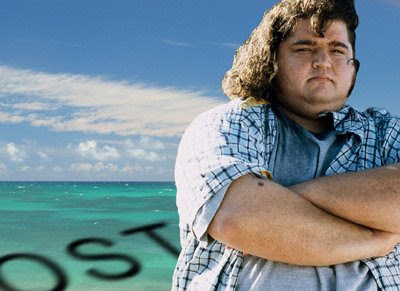 Promise I'm not a stocker chick... but I LOVE Lost! Hugo! Very cool. I haven't seen him on The Tonight Snow, where other Lost cast have shown up (usually the ones who've been killed off, like Charlie and Ana-Lucia). He seems like he'd be a great guy to hang out with. I'm jealous you met him.